Deal follows the recent Vail Resorts' $182.5M purchase of Park City Mountain Resort. 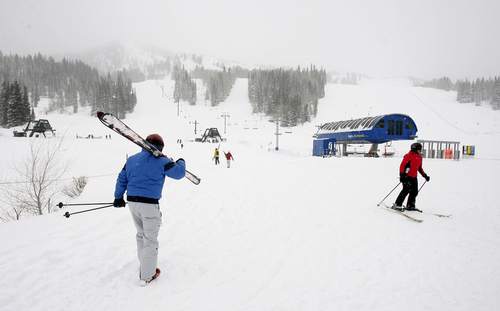 Tribune file Solitude Mountain Resort, pictured, is being purchased by Deer Valley Resort. 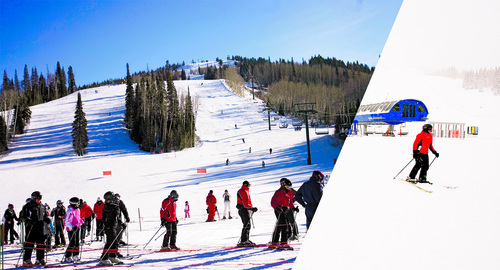 Deer Valley Resort, seen in the photo on the left , is purchasing Solitude, which is seen in the photo on the right. Deer Valley Resort is buying Solitude Mountain Resort and will take over its operations this May  the second major shift in Utah&apos;s ski industry in weeks. The purchase was a private acquisition and a news release about the deal does not disclose how much Deer Valley paid. The Deer Valley management does not anticipate "any major changes in staffing at Solitude at this time," according to a Deer Valley Resort news release. Some of Deer Valley&apos;s staff will work alongside Solitude&apos;s this winter to learn how they manage the resort, the release adds. "Solitude has a distinct brand. What we want to do is build upon that brand," said Coleen Reardon, Deer Valley&apos;s marketing director. The Summit County resort will bring some of its service-oriented philosophy to Solitude, but they have no intention to re-brand. Deer Valley intends to keep snowboarding available at Solitude, and a name change would be limited to some acknowledgement that it&apos;s now part of Deer Valley. "We get that it&apos;s not what we have [in] Park City," Reardon said. In an another significant change for Utah&apos;s ski industry, Vail Resorts Inc. bought Park City Mountain Resort in early September for $182.5 million. In its announcement, Deer Valley rejected the idea that its purchase of Solitude was in response to Vail&apos;s acquisition. Deer Valley entertained the possibility of buying other resorts in the past, though obviously those purchases never materialized. However, Deer Valley had been talking to Solitude about this deal for the past two months, an in earnest the past two weeks, Reardon said. Solitude is "a jewel" that&apos;s been well-run for a long time, Reardon said, and its location in Big Cottonwood Canyon improves Deer Valley&apos;s brand awareness. "Solitude came to us at the right time and for the right reasons," the announcement adds. The DeSeelhorst family has been running the Salt Lake County resort, and are "proud of what we have been able to accomplish at the resort and in our mountain community," said Dave DeSeelhorst, owner and general manager of Solitude Mountain Resort, in a statement. "I gotta say, I&apos;m thrilled," said Nathan Rafferty, president of Ski Utah. "I don&apos;t know if there&apos;s a better ski resort operator in North America than Deer Valley, and having them spread their wings a little bit and run Solitude, I think it&apos;s only a good thing." Susie English, spokeswoman for Ski Utah, added that "it&apos;s nice to know it&apos;s going to stay within the Utah family." The news came as a surprise to Carl Fisher, executive director of Save Our Canyons. While they don&apos;t have much of a working history with Deer Valley, they look forward "to engaging with them to protect the wonders of central Wasatch Mountains," Fisher said. The purchase also won&apos;t affect the lift and season pass rates that Solitude announced for the 2014-15 season, according to the release. The announcement makes no promises about the future, though. "Moving forward, Deer Valley Resort will analyze past resort performance, operational expenses and projected revenue potential prior to setting rates," the release states.